I know that your first thought is "OMG it's only a tarp - I'm going to die from exposure or wildlife if I don't have an enclosed shelter". But fear not, tarps are your friends. Sometimes they are backstabbing evil friends (when used inappropriately) but for the most part I find that tarps actually help me to feel even more connected with myself when camping outdoors. Tarps allow you to face your fears and actually be open to the earth, and the wind, and the wildlife. With a little practice, tarps amplify your enjoyment of the wilderness. 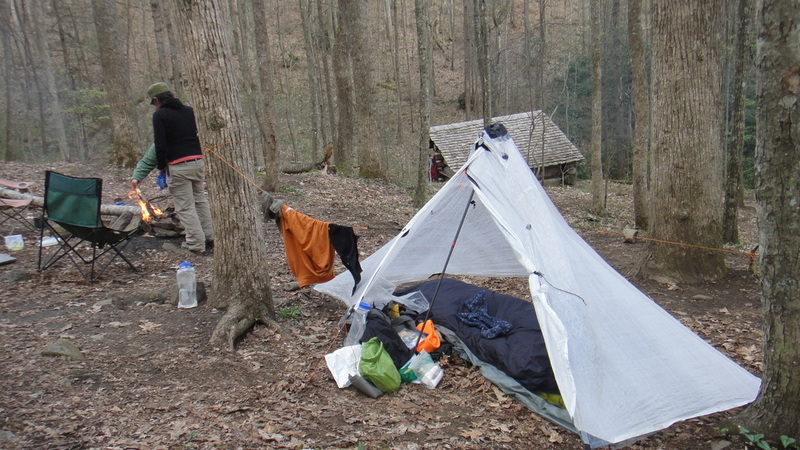 Here is a review of the very first tarp I used on a long trip. I'm kind of sentimental about this tarp, but I'll try to be neutral in reviewing the pros and cons of this tarp. My MLD Cuben SoloMid set up with my MLD Superlight Bivy and Gossamer Gear LTS4 Trekking Poles - guylines are doing double duty as a clothes-line. Plenty of internal space to keep stuff, even with my long-length 6'6" sleeping bag inside.